Brad Longazel is a personal trainer and exercise physiologist in Louisville, Ky., having worked in physical therapy clinics and collegiate strength-and-conditioning facilities. He holds certification from the National Strength and Conditioning Association and is recognized as an Olympic weightlifting coach by the U.S. Weightlifting Association. Longazel earned a Master of Science in exercise physiology from the University of Louisville. The direct cause of being flat footed is linked to a muscular imbalance in the intrinsic muscles of the foot and ankle. When your main arch-supporting tendon, the posterior tibial tendon, decreases in strength due to muscle decay or injury, the foot begins to flatten and can cause pain during normal activities. Weakness in the tendon can be present at birth due to genetics or can develop from early walking patterns. However, in most people who experience fallen arches, it comes from strain due to aging or placed on the feet from standing or walking in heels for long periods of time. Improper footwear that doesn’t support the arch of the foot, diabetes and obesity can increase your risk of developing fallen arches. The muscles that are under your feet are responsible for raising the arch of your feet. 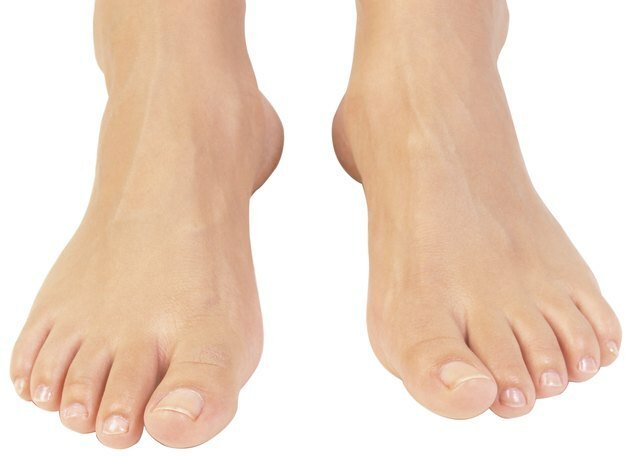 When these muscles are weak, the foot flattens and can cause pain. You can strengthen your intrinsic muscles with a Pilates-based towel exercise. Sit in a chair with a towel spread on the floor in front of you. Place your heels on the edge of the towel nearest you. Without scrunching up your toes, move the far edge of the towel toward you by pulling the balls of your feet towards your heels. After each small movement, lay your feet flat on the towel, without moving your heels, and pull another piece of the towel toward you. If you suffer from fallen arches, the deformity may be more pronounced when you stand. Any standing exercise will place strain on the posterior tibial tendon and cause the foot to flatten. Shifting the weight around your foot from the inside to outside edge of your feet while standing can be an effective way to strengthen arches to help correct the fallen arch. If this adjustment is difficult, a podiatrist might recommend orthotics. The large muscles that control your ankle movements can also help fix your arches. Standing calf raises work these muscles. Place your toes on the edge of a stair or raised surface with your heels hanging down, and then lift your heels as high as possible. This movement help to restore the arches of your feet and strengthen the entire foot and ankle complex as well. Gradually starting an exercise program and walking in comfortable appropriately fitted shoes will provide the support and strength needed to restore your arches.